The Sable Warlock Joins Creative Twilight! 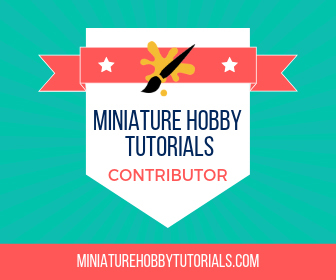 HomeMiniature HobbyShowcaseThe Sable Warlock Joins Creative Twilight! Hi all! The Sable Warlock here! This is my first article here at Creative Twilight and first off I’d like to thank Thor for welcoming me to Creative Twilight! I started painting about 2 years ago and I mainly learned about painting through blogs, YouTube and most importantly trial and error. I don’t claim to be an expert and I am definitely amateur at best, so whatever I say take it with a pinch of salt! My painting style mainly involves using a shaded base coat with progressive glazing for highlights and I find this style of painting gives a good well blended colour on the miniature. I mainly paint Warhammer 40k miniatures, most commonly Eldar, of which I have about 700 points painted and about another 3,000 points in either bare plastic/metal or in need of stripping. I also have been eyeing some chaos daemons and some might be jumping onto my desk from the warp! I occasionally also help my brother out by painting his Tyranids. Eldar Autarch with Fusion gun, Power sword and Wings. The principal colour scheme for my Eldar army is varying tones of blue, bone and other vibrant colours to accent the blue and bone. I mainly use Games workshop paints supplemented with Army Painter, Vallejo, Formula P3 paints and Warcolours. For brushes its quite a varied mixture, for rough stuff I just use some generic Windsor and Newton synthetic brushes, but for highlighting and finer work I tend to use either my Windsor and Newton Series 7 Miniature sable brushes or more recently, sable brushes from Warcolours. I will be going into a lot more detail regarding paints and brushes in a later article. My aim for this blog is to be concise and to the point and try to add as many photos as possible to keep the articles interesting and exciting. Regarding the photo quality these were taken using my phone so unfortunately they aren’t the best possible, this is something else I wish to address in a future article. I’m always looking for feedback so whatever you have to say just drop a comment below and I’ll be sure to get back to you! My next article will be a tutorial so be sure to look out for me! First off, welcome to the blog. It’s great getting so many new faces in here. Your Eldar look great. Good use of blending. I’ve always liked Eldar, though I don’t play them. It’s one of those armies I plan to play “some day”, but just never get around to it. Nice looking models there for sure. Looking forward to seeing what you do next. Thanks! Hopefully won’t be too long! I've been interested in Warhammer since i was about 14 years old, I only really got into painting and hobbying when i was 20 years old. Everything i learnt is mostly through trial and error and online tutorials. I do not claim to be an expert but i'm always looking to help other people. At the moment i'm mostly into 40k and i have an eldar army. Recently i've also gotten into tzeentch daemons.